BRITISH police have named two suspects, both Russian nationals, in the poisoning of a former Russian spy and his daughter in Salisbury in March, with the British prime minister calling the men Russian intelligence agents. 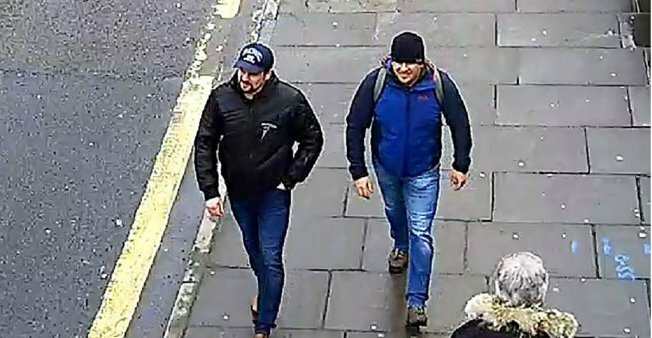 Crown Prosecution Service – CPS,said Wednesday, that Alexander Petrov and Ruslan Boshirov are wanted for alleged conspiracy to commit murder in connection with the nerve agent poisoning of Sergei Skripal, 66, and his daughter, Yulia, 33. Prosecutors say they have enough evidence to charge both Russians with conspiracy to murder Sergei Skripal, attempted murder of Sergei Skripal, Yulia Skripal and Nick Bailey, and use and possession of Novichok contrary to the Chemical Weapons Act. Bailey was a police officer who came into contact with the pair at a park in Salisbury and was treated for injuries as a result. All three have recovered from the attack, with Yulia being released on May 23 and her father’s release after that. Yulia spent 20 days in a coma. Three months after the Skripals fell ill, two more people in Salisbury came into contact with Novichok and police said today they have ben unequivically linked the two incidents. Dawn Sturgess, 44, died July 8 from Novichok exposure. Her partner, Charlie Rowley, 48, was also treated in the same Salisbury hospital and later released. “We do not believe Dawn and Charlie were deliberately targeted, but became victims as a result of the recklessness in which such a toxic nerve agent was disposed of,” police said Wednesday. “We know that Novichok was applied to the Skripals’ front door in an area that is accessible to the public, which also endangered the lives of members of the public and emergency service responders. Reading the announcement Wednesday, Assistant Commissioner Neil Basu, National Lead for Counter Terrorism Policing, also walked through the Russian suspects’ exact movements.